Bachelor officials are masters at transforming the mountain’s liabilities into assets. To offset the decrease in skier visits on days when the Cascade weather turns ugly, in 2009 the mountain developed a unique sliding scale of lift ticket pricing. 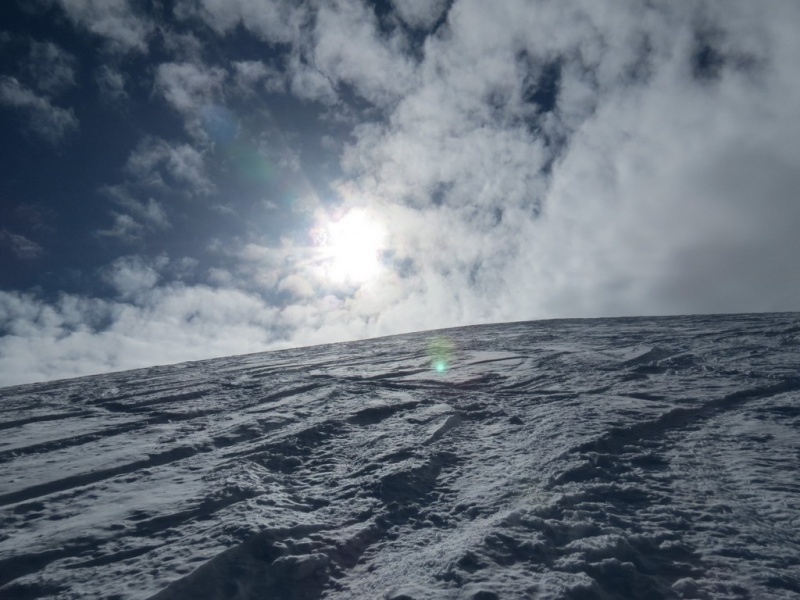 Weather days are classified by the colors green, blue and red, depending on such factors as wind, temperature, snowfall and the number of lifts operating, and lift ticket prices are scaled from $53 to $73 as a result. 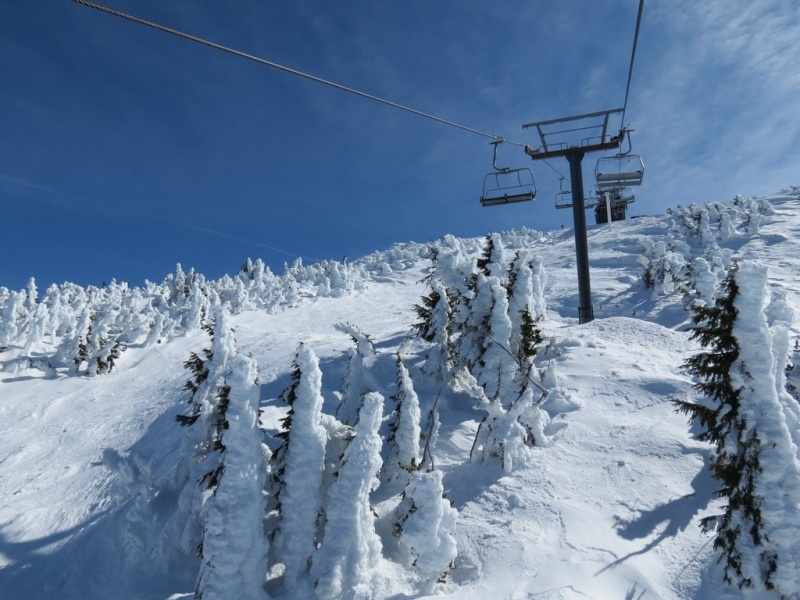 Recognizing that flexible pricing isn’t enough, however, Mount Bachelor officials are anxious to add more weather-protected terrain to the mix. They’re in the process of submitting an Environmental Impact Statement (EIS) to open 1,200 additional acres of terrain on the sheltered southeastern flank of the lower mountain. The bottom terminal of the proposed lift sits in a protected area at an elevation of about 6,100 feet. It would carry skiers in a westerly direction to a top terminal near treeline, at about 7,200 feet near the top of the current Rainbow chair and a short distance from the base of the resort’s Summit quad. Under the proposal, however, the Rainbow lift would be shortened, as would the present Red Chair to better accommodate racers. Current plans call for the clearing of roughly a dozen ski trails surrounding the new lift, although Rathbun noted that trail clearing is more akin to forest thinning than anything else, given the widely spaced trees in the area, and it is well sheltered from the mountain’s prevailing northwesterlies. Indeed, it is. We had a chance to sample the proposed new acreage with Lomax and Goggins, and found gently undulating terrain as we bobbed and weaved through the mountain’s signature hemlocks and lodgepoles. Frankly, it was a hoot. After a short ride on a ski patrol snowmobile we were back within the current ski area at the Sunrise Lodge. Rathbun said that the proposed terrain is located within Mt. Bachelor’s existing Forest Service permit area, meaning that it can be opened provided that no critical environmental concerns are identified. Of particular interest to more advanced skiers, however, the new lift’s base will allow the mountain’s east catch line to be moved 500 feet lower, permitting longer, more sustained fall line skiing beyond the resort’s existing Wanoga Way run and Cow’s Face. Even without the proposed new terrain, by any measure Mount Bachelor is already a huge hunk of lava. The Cirque, known as “The Bowl” to locals constitutes the steepest terrain on the mountain’s eastern face. I had to check it out. Others, however, were much smarter. 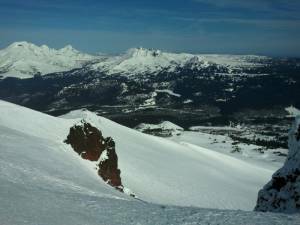 I was the only one to shoulder my skis and hike to the top of The Pinnacles, a series of steep routes that thread rock spires between the Summit Express and the mountain’s West Ridge. Once I saw the windswept, eroded sastrugi gracing these slopes I understood why. No matter, for I was here to experience all that Bachelor had to offer. I pushed off. The face quickly mellows into a spacious bowl before it backs up against a glacial moraine to deliver another steep final drop toward the resort’s mid-mountain Pine Marten Lodge. The sensation was other-worldly, and in my solitude I had found Bachelor’s wilderness experience in spades. This terrain would be incredible on a powder day. The Pine Marten Lodge itself is spacious as well, almost downright cavernous. A coffee shop and a sit-down restaurant, Scapolo’s (Italian for “Bachelor”), occupy the first floor, while a massive cafeteria featuring fresh street-style Mexican dishes in addition to the standard burgers and fries completes the lodge’s second floor. When the resort developed the terrain surrounding the Outback Express lift in the 1980s they found it prohibitively expensive to build a road to access a lodge at its base. Instead, the Pine Marten Lodge was built to be easily accessible from the top of the resort’s Outback Express and Pine Marten Express lifts, allowing it to serve as a de facto day lodge halfway up the mountain. Activities at Mount Bachelor itself aren’t limited to skiing and riding. The resort’s Snowblast Tubing Park features eight 800-foot lanes and operates on weekends and holidays from 10 a.m. to 4 p.m. A more unique offering, however, is the dog sledding program offered by Oregon Trail of Dreams out of the resort’s Sunrise base area. 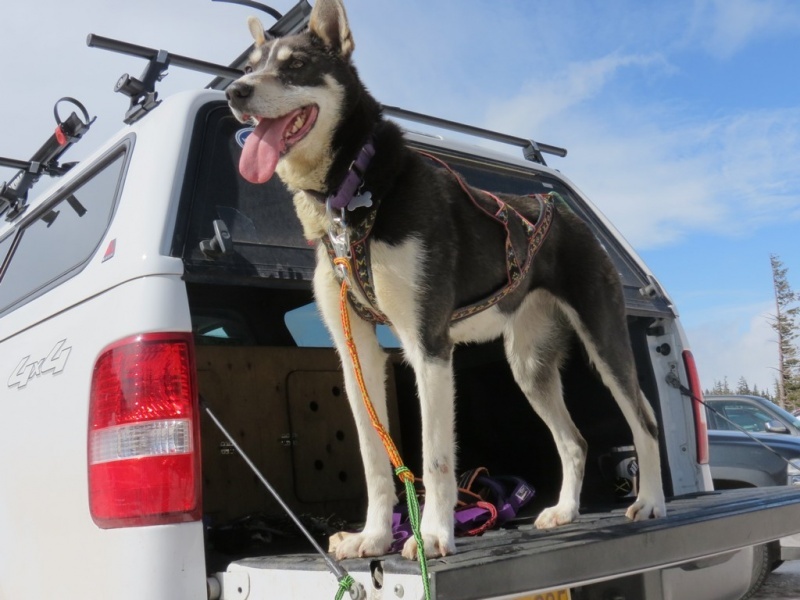 Max and I had a chance to meet Oregon Trail of Dreams owners Jerry Scdoris and his daughter Rachel, a legally blind competitor who fought to race the Iditarod in 1996, before taking an hour-long ride through the forested trails surrounding Mount Bachelor with Alaskan musher Gabe Dunham. Speeding through the woods behind a team of barking dogs provides a wonderful family diversion off the slopes. For a true well-rounded vacation, however, it’s the town of Bend that delivers the goods. A genuine multi-sport town, one can ski or ride in the morning at Mount Bachelor and wrap up the day in Bend and environs playing golf at one of numerous area courses, climbing at Smith Rock, mountain biking on Horse Butte or pedaling a three-speed around town, or paddling a kayak, canoe or stand up paddleboard on the Deschutes River. The Deschutes Brewery, Bend’s largest craft brewer and maker of Mirror Pond Ale and Red Chair Ale, among others, offers fascinating tours of their brewing plant and bottling line. 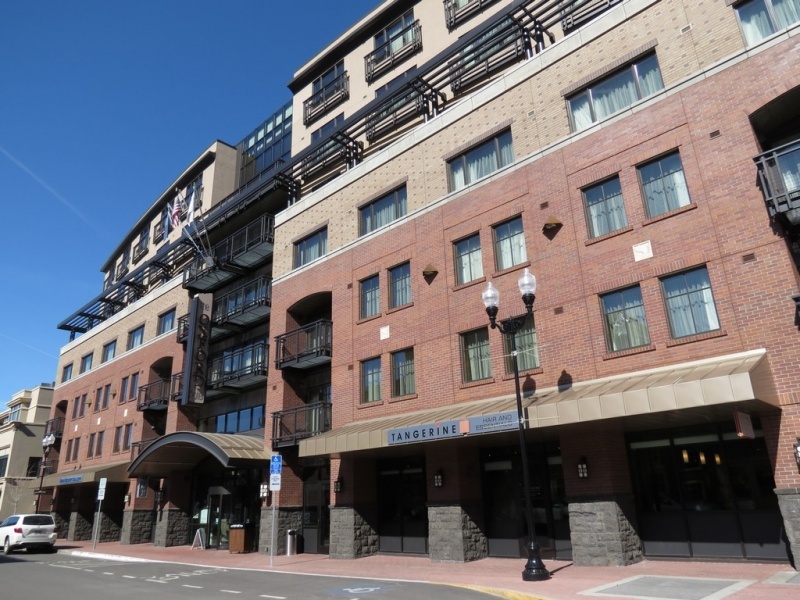 Lodging options abound in Bend and environs. Our stay at the Oxford Hotel, an upscale boutique property situated right downtown within walking distance of most of Bend’s shops, pubs and restaurants, provided the finest service that I’ve experienced in years. Guest rooms are large and well-appointed, and are complemented by a top-level fitness center complete with sauna and steam room. My grilled filet mignon at the hotel’s 10 Below restaurant, accompanied by a gruyere infused potato and leek gratin, sautéed brussels sprouts with preserved lemon brown butter, Rogue Valley blue cheese crèma and a rich au jus, delivered what was arguably the finest meal of our trip. While prices at the Oxford are quite reasonable when compared with those at similar properties at more well-known ski destinations, families and friends visiting Bachelor on a budget may consider renting a home in Sunriver, a large development located 20 miles from Mount Bachelor and 17 miles from Bend. 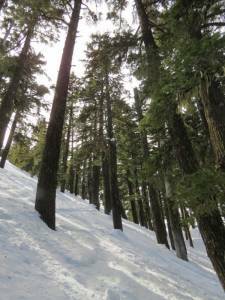 It’s not too late to plan a trip to Mount Bachelor this season, for First Tracks!! Online correspondent and snowfall expert Tony Crocker awards the mountain with the best spring corn snow in North America, and the resort plans to operate through Memorial Day Weekend this year. 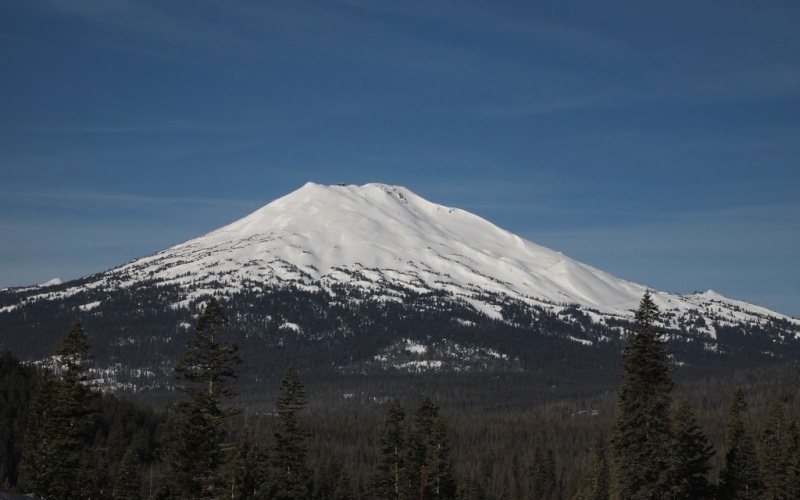 Beginning April 16 operations will shift to 9 a.m. to 2 p.m. daily for the spring corn harvest, and after April 30 Mount Bachelor will operate Thursdays through Sundays only. 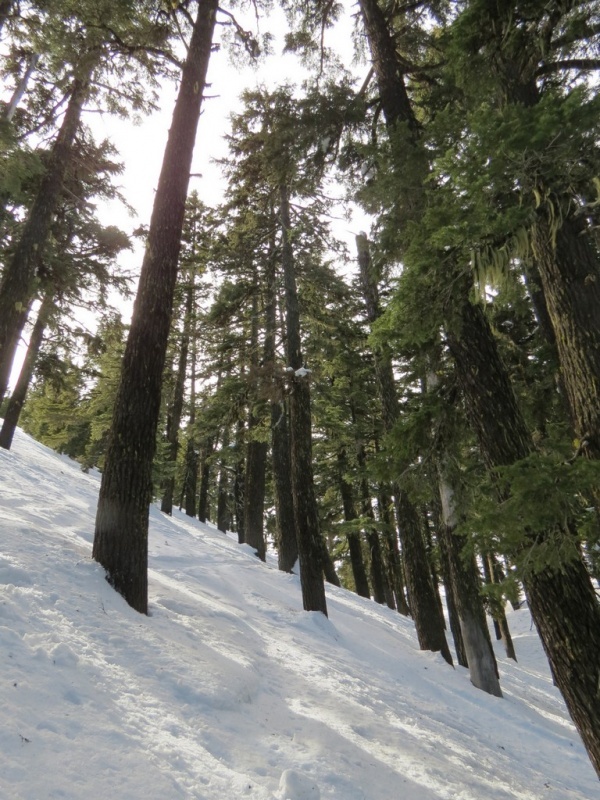 Weekly special spring events will include Friday Pine Parties with lifts spinning until 7 p.m., the Deschutes Brewery Concert Series, The Big Wave Challenge, barbeques and more. After the dog sled ride on our last day I implored Max to let me take one more run. From the top of the Pine Marten Express I descended the Leeway run, clicked out of my skis and began a solo hike up the Cinder Cone, a volcanic feature on the lower mountain’s northeastern flank. Always open to backcountry skiers skinning up from the West Village base area below, the Cinder Cone is but a five-minute hike from the resort’s lift served runs for a taste of backcountry-style terrain still within the ski area boundary. Standing alone at its top I paused for a moment to gaze across Sparks Lake and the Oregon wilderness to the Three Sisters. Mount Bachelor’s trademark breezes blew. Dropping down the consistently pitched 40-degree face of the cone I ironically found the best snow of the trip — dry, chalky and only lightly tracked. It was the perfect way to bid Mount Bachelor adieu. My visit may have ended with my first trip down the Cinder Cone, but it won’t be my last. Redmond Municipal Airport, a.k.a. Roberts Field, is served by Allegiant, Delta Airlines, Alaska Air, United and United Express with daily direct flights to Denver, Portland, San Francisco, Salt Lake City, and Seattle and flights two days a week to Las Vegas and Phoenix-Mesa. Delta, United and United Express flights are operated by SkyWest Airlines. The airport is located an easy 17-mile drive from Bend. In addition to the aforementioned 10 Below restaurant in the Oxford Hotel that serves three meals a day and Brother Jon’s Public House, we enjoyed exceptional meals during our stay at 900 Wall, Zydeco, and Trattoria Sbandati, where the homemade gnocchis are not to be missed when they’re on the restaurant’s ever-changing menu. For breakfast or lunch, you can’t go wrong with the fresh local ingredients at Chow, where they even have their own herb garden out back. In Bend, après-ski is all about the town’s many craft breweries. The 10 Barrel Brewing Company was my personal favorite thanks to its huge outdoor patio, fireplace and bar that’s open to the elements when the elements choose to cooperate. Cascade Lakes Brewing is home to a spacious pub and restaurant called the “Lodge” right on the way back to Bend from Mount Bachelor. The most popular brewpub, however, appears to be that of the Deschutes Brewery at the north end of downtown. 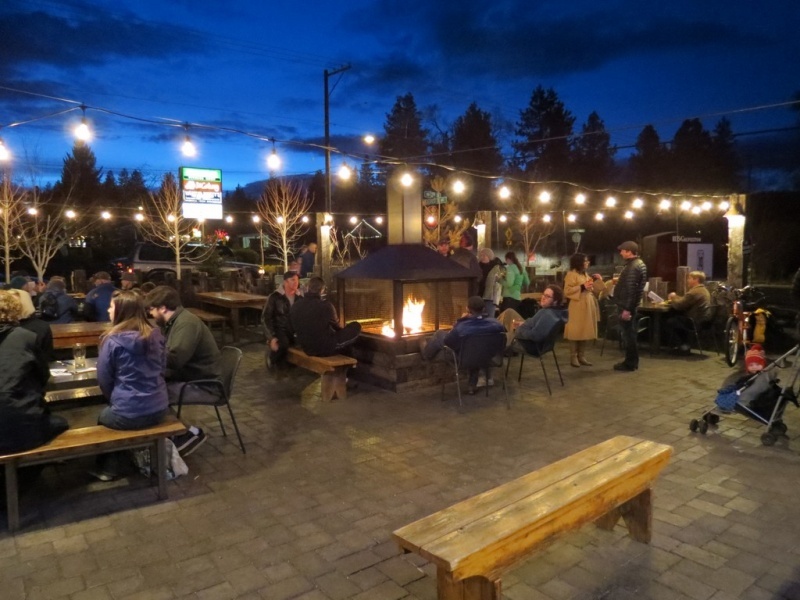 Visit Bend has created the Bend Ale Trail featuring 10 of the brewpubs navigated via a Passport or smartphone app, or you can hop aboard the Bend Brew Bus with Wanderlust Tours, which also offers kayak, canoe and cave tours in the Bend area.